Get Answers To Your Most Commonly Asked Sliding Door Repairs FAQs. The number of questions we always get asked regarding sliding door repairs is pretty high, so we’ve taken the time to provide as much value to you by answering many of these commonly asked questions. 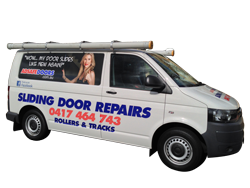 If your particular questions haven’t been answered then be sure to give us a call and speak to us directly in Sydney on 0417 464 743 for any of your Sliding door repair questions. What are the most common Sliding door repairs? The most common repairs are Aluminium sliding door repairs, Timber sliding door repairs, glass sliding door repairs, Wardrobe sliding door repairs and cavity sliding door repairs. Of these most are domestic sliding doors, and that is because nearly every home has a sliding door of some sort. Not only are they most common many were built forty years ago and sometimes the correct parts can be difficult to get. So we carry a vast range of door rollers & window rollers with carriages in our vans so that we can complete a sliding door repair in minimum time. Should I replace my jamming sliding door or get it repaired? We find that most sliding doors can be repaired. In fact, most sliding door repairs are so successful that our clients wonder why they did not get the sliding door repaired much earlier. However when excessive rot or corrosion are present replacement may sometimes be the only option. How long do sliding door repairs take? The average time for a sliding door repair is about two to three hours. A typical sliding door repair is, to first remove the side panel, then remove the door followed by the removal of the bottom rail of the door. The worn carriages and rollers can then be removed. Clean up the bottom rail and then fit the correct new door rollers and door carriages. The door is then refitted to the track and adjusted to be square in the frame and align with the lock. Put back the fixed panel. We usually use new fasteners where appropriate. Should I get my sliding door repairs done by an expert or do it myself? For good results on fixing anything, an expert is much more likely to give you the result you want as opposed to DIY or Handyman services. You should use an expert to carry out all your repairs no matter what they are. In the end, it will cost you less, and you will not have the hassles or time inconvenience. You are better off doing the things you love. Door repairs are no different. DIY and the local handyman is very often the cause of a lot of the problems associated with the door repair in the first place because they have no training. Always remember that an expert is best suited to do the repair because he/she has training and experience, and is part of the network of repairs to do that particular fix. I know the rollers are worn out in my sliding door, but the track is in really bad condition. It is worn flat in some parts, and there are metal chips and filings around the track. 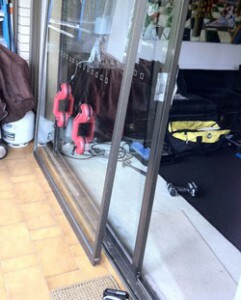 Are you able to repair this sliding door and track? Yes, we can fix your sliding door because we carry many different sliding door tracks and one will be suitable for your sliding door repair. The frame at the top of the door seems to have dropped down a bit, and the door is scrapping, and we can’t open it because it’s rubbing all the time can this be fixed with a door repair? If the lentil has dropped a little over the sliding door, we may need to trim the top or bottom of the door to give enough clearance so that the door does not scrape. My door is old, it’s about 40 years old, and I really would like a sliding door repair that works, can I get this sliding door repaired or do we have to buy a new door? Even if your door is old, we can repair any type or age of sliding doors. The front Sliding door of our house won’t close properly, and the lock won’t line up properly. We had a handyman do a sliding door repair, but it did not last. After a few weeks, the side of the door started to come away from the glass when I opened it. Can this be fixed? This is a very common problem. When the handyman did your sliding door repair he snapped the head off the fastener at the bottom of the door and was not able to remove the body of the fastener so that when he put it back together he was not able to screw the side onto the bottom plate so when you pull on the side of the door to close it comes away from the glass. We can fix this for you because we can remove that broken fastener. Our sliding door is so noisy, my neighbours upstairs complained about the noise, and they said I needed a sliding door repair. Can you fix this so that it slides quietly because I don’t want to upset my neighbour? Some sliding door rollers that have tires are worn out completely, and the inner ball bearing is running on the sliding door track which causes the noise. We can replace the rollers and carriages and use durable nylon tires on the door rollers. This will make the sliding door run quietly. I called a local builder to do a sliding door repair, and he said that he could not fix it because he would not be able to get the door out. Since you are an expert would you be able to repair it? Sliding door repairs can be difficult in some circumstances when it is difficult to remove the door. However, I do not recall a time when we were not able to remove the sliding door. We have a restaurant in Bondi with six big sliding doors, and when we go to lock up the doors at night we have a big problem closing & locking the door would you have the sliding door rollers for these doors. The door rollers will be at the top or bottom of the door. Either way, we can do a sliding door repair to your restaurant. I have a cavity sliding door between the kitchen & the dining room, and it is impossible to move I think the top roller is broken can that be replaced? Most cavity sliding door repairs involve the adjustment or replacement of the top rollers, but sometimes the track may be damaged or pitted and therefore require replacement.